A modern Chinese coin graded by Numismatic Guaranty Corporation (NGC) led the way at Heritage Auctions’ World Coins & Ancient Coins Signature Auction in Hong Kong earlier this month. The extremely rare 1989 Dragon & Phoenix Pattern Gold 200 Yuan, graded NGC PF 69 Ultra Cameo, realized an astonishing $408,000. All in all, five of the top six coins in the auction were Chinese coins certified by NGC, including a 1907 Gold L&M-1024 Small Clouds Tael, graded NGC MS 63, that sold for $150,000. This coin was encapsulated with the NGC Red Dragon label, indicating that it was evaluated by the NGC Advanced Chinese Authentication Bureau (ACAB), which was established in March 2017. 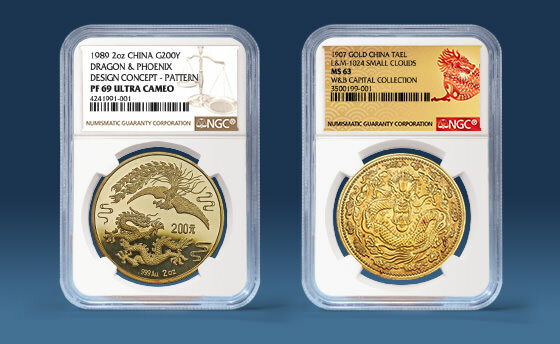 The extraordinary results for these and other NGC-certified Chinese rarities reflect the strong demand for NGC-certified Chinese coins.